For this reason, the Hwaen Pirod of Luang Por Hai became a legendary amulet, especially due to reports of miraculous survivals by local devotees of Wat Bang Talu who wore the ring, which flowed in over the years. When we speak of the Petchburi Province Masters of Old, one will always hear of and think of the temples of Wat Tanode Luang (Luang Por Tong Sukh and Luang Por Phaew), at Grajiw, and of course Wat Khao Bandai It (Luang Por Daeng). The Hwaen Pirod ring, was an essential part of the occult and ceremonial armory and regalia of the ancient Warrior of Siam. The Warriors of Olden Days used both scientific weaponry such as swords, knives, maces, lances, clubs and other weaponry and armour, but also armed themselves with a highly practiced and memorised repertoire of Magical Spells and Sorcery, to protect and aid in winning the battle. The Wicha Kong Grapan and Klaew Klaad are both directly derived from the Warrior Clans, who recieved these Wicha from their Lersi Kroo Ba Ajarn, for their own protection. The ring is made from Sacred Yantra Cloth, Sinjana Corpse Cords and coated with laquer. 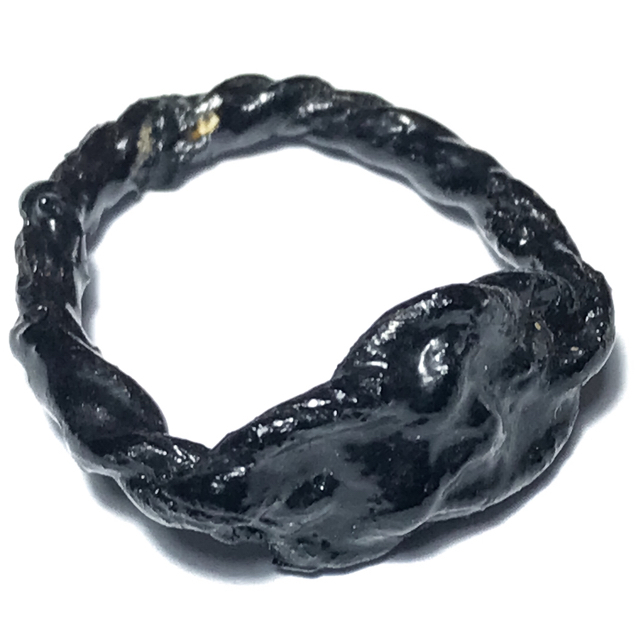 The Pra Pirod Ring Amulet is a Wicha of Kong Grapan Chadtri and Klaew Klaad Evasive Protection is effective as a protective spell against all forms of black magic, sorcery, evil eye, demons and physical dangers, which derive from weapons of war, sharp and blunt instruments. Klaew Klaad Evasive Magic is also inflected to prevent any deadly accidents or disasters from befalling the wearer. Klaew Klaad Evasive Magic is also inflected to prevent any deadly accidents or disasters from befalling the wearer. The ring offers Protection against Black Magic, and all forms of Sorcery, Curses, Evil Eye, Demons. Protection and Evasion from all Physical Dangers, all sharp and projectile weapons, and especially death by fire and burning.